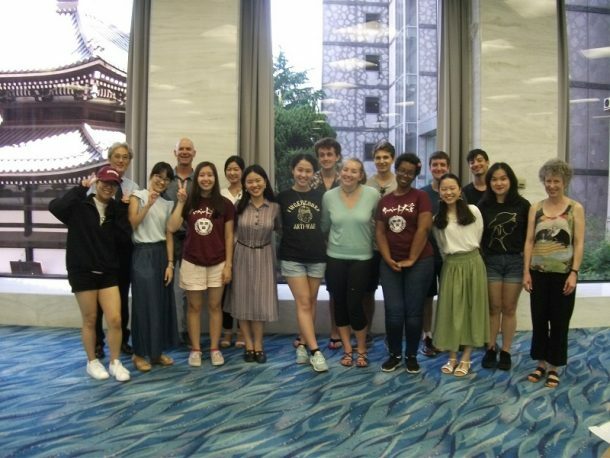 On July 24th 2018, Ikenobo Headquarters was honored to receive 18 participants of the Harvard Summer School Kyoto Program sponsored by Doshisha University for the sixth consecutive year. A group had a brief tour to the Rokkkudo Temple, Dojo, Ikebana Museum, and the advanced Shoka class of the Ikenobo Central Training Institute. During the viewing of the classroom, visitors were amazed at the beautiful arrangements and enjoyed talking with the Ikenobo students of the class, learning from their experiences. Ikebana workshop was held by Ikenobo Headquarters Professor Manabu Noda. Prof. Noda illustrated some of the important aspects of ikebana and Japanese culture with examples such as the spirit of harmony, feeling of life and passing of time. 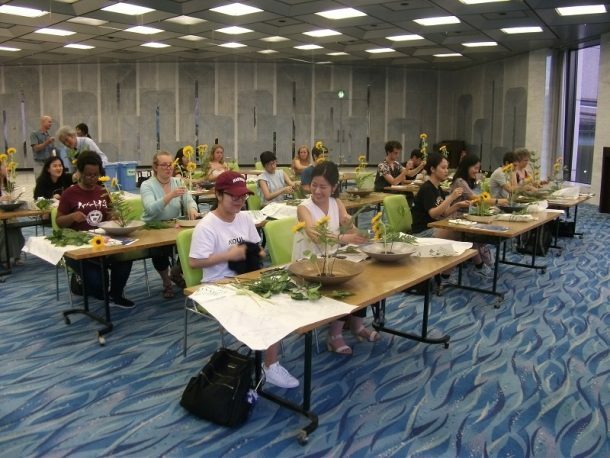 Following his instructions to “talk with flowers” and “search for the most beautiful face of flowers”, the participants created free style arrangement using sun flower, spray carnation, Dracaena and fern. Prof. Noda gave critiques to all of their arrangements. They realized the value of Ikenaba. In his closing remarks, Prof. Noda emphasized the preciousness of playing catch with flowers to refresh oneself in modern society, since the more convenient life becomes, the less verbal communication people have, and he encouraged the participants to have contact with living plants in their home once in a while in their busy lives. 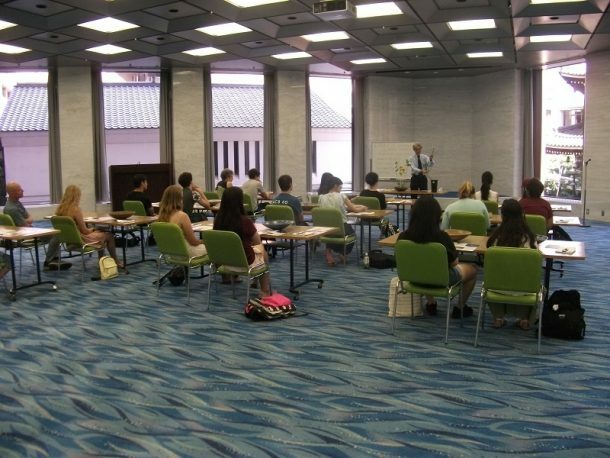 We hope that participants had a good experience in learning ikebana.